Hydraulic swivel joints for tracked excavators, robust and long lasting over time, suitable for withstanding the intense operation of earthwork machinery. Fluid swivel joints for rough-terrain crane trucks, characterised by a high number of passages and suitable for transferring multiple fluids. Complex fluid swivel joints for swivelling telehandlers, fitted with electrical collectors for power and CAN BUS signal transfer. Hydraulic swivel joints for telescopic aerial platforms, always fitted with or installation ready for high performance electrical applications. The Code of Ethics describes the rules for achieving our goals in terms of the company's social responsibility. LEADER IN THE PRODUCTION OF HYDRAULIC SWIVEL JOINTS SINCE 1974. 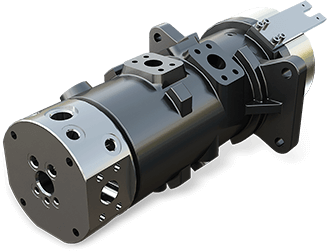 ALA OFFICINE SPA has been designing and manufacturing hydraulic swivel joints for earthwork machinery, crane trucks and hoisting, aerial platforms and many other sectors for 40 years, from the naval marine sector to the industrial and metal sectors. ALA OFFICINE SPA is an undisputed leader in Italy and a reference company all over Europe and North America in the turning joints market. In order to always provide a complete service, the company integrates its hydraulic swivel joints with electrical swivel collectors suitable for any type of signal: power, analogue, digital and CAN BUS. 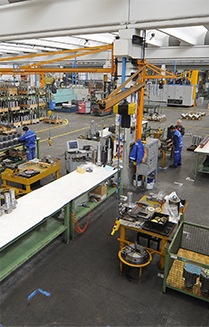 Constant commitment to technical research and the use of top-quality raw materials enable ALA OFFICINE SPA to offer high-performance rotating hydraulic joints with a level of quality that meets the new requirements of the market. The wide range of products and an efficient pre- and post-sales technical assistance service are the hallmarks of the company and the means by which it meets the needs of clients in multiple sectors.